Three faculty from the University of Wisconsin MBA Consortium had the opportunity to attend AACSB's Redesigning the MBA Curriculum Conference, May 9-11, 2018, in Salt Lake City, UT. According to the conference website, "...this conference is designed to aid business schools to think strategically about questions of purpose, positioning, and program design, as well as offer guidance through the curriculum redesign process." Dr. Suresh Chalasani, Professor of Management Information Systems from UW-Parkside, had a positive experience attending the conference. 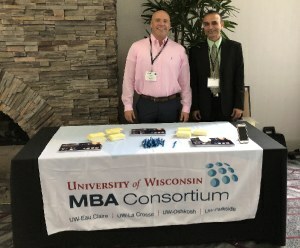 "I very much enjoyed this conference as it discussed the emerging trends and presented insights on the changing landscape of the MBA curriculum." Dr. Paula Lentz, Associate Professor of Business Communication from UW-Eau Claire, was invited to speak at the conference to share her perspective on the role of communication as a broad skill in the MBA curriculum. "I enjoyed talking with MBA faculty from around the world about communication skills development in the MBA curriculum," said Lentz. "The audience generally agreed that MBA programs must see communication skills development as an investment in students' professional success. The UW MBA Consortium has long recognized the importance of communication in the MBA curriculum. Our students are fortunate to have opportunities to develop their communication skills, and I believe their degrees and their professional lives are richer as a result." As always, "power skills," such as relationship-building, teamwork, emotional intelligence, cultural curiosity and empathy, and communication skills, play a significant role in forming the MBA curriculum, reported Chalasani. He also noted that employers are looking for employees for Digital-Era Leadership; in other words, we need to bridge the tech experts with the internal and external stakeholders by communicating the story data are telling us. Additionally, leaders need to foster opportunities for connectivity and hyper-collaboration, and promote digital literacy among employees within their organizations. Dr. Brent Opall, Assistant Professor of Management at UW-Eau Claire, also attended the conference. He shared that enrollments in MBA programs were up by 25% since 2014. To maintain distinction among the top MBA programs, the UW MBA Consortium will need to explore strategies for maintaining our competitive advantage with the changing needs of MBA students. UW MBA Consortium faculty will have an opportunity to engage in brainstorming new opportunities for the program at the 3rd Annual Faculty Meeting during the 2018-19 academic year. Chalasani, Lentz, and Opall will also share additional take-aways and insights from the conference at that time.